Four Banbury Harriers came home with trophies for their winter’s efforts after the last Chiltern Cross Country League on Saturday at Milton Keynes. In the U11 Girls race Isla McGowan had her best result of the season in second place, just 6 seconds behind the winner Isabella Haines-Gray from Oxford City. McGowan got caught up at the start of the race and took a while to get through the crowd and into her running, but picked off runners and was reeling in Haines-Gray. 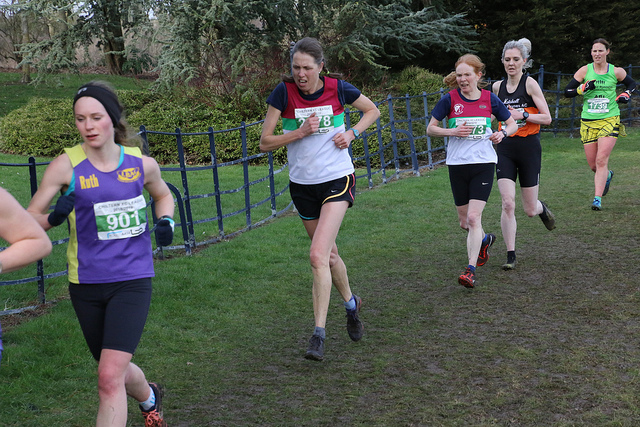 Given another few hundred metres she may well have caught her, but was happy with her second position from the 87 runners, and was also rewarded with 3rd overall for the season. Another U11 Girl with her best run of the season was Charlotte Hall in 7th. In the senior ladies race Ros Kelling, coming into some form right at the end of the season, used the technical downhills to her advantage and finished in 47th position, just 4 places in front of her team mate Michelle Bartlett. The pair were rewarded with first F55 and second F45 respectively for the season. Lisa Ansell made up the team in 108th of the 240 runners. Glynn Pritchard was another to have a consistent season in the senior mens race. Over the energy sapping 8km course he finished in 356th place, which kept him in first place M70 overall. Simon Pritchard was 238th, Mark Scrivener 257th, Phil Coy 343rd and Neil Forbes 357th in a field of 381. Tilly Lainchbury battled hard in the U13 Girls race and was just caught on the line to finish in 10th place, her best result of the season. Sam Davis had a good sprint finish and came home in 32nd place in the U13 Boys race.